Twelve men good and true met at Winchcombe today, to deal with a vast pile of new wooden sleepers, which all had to have chairs bolted to them for the platform roads at Broadway. Due to logistical issues there were no more concrete sleepers for us to lay on site, so we directed our efforts at chairing up (some of) the 600 hardwood sleepers just arrived. 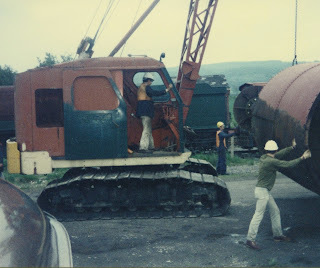 Here are some of them by the wrecked coaches (they do not belong to the GWSR) and the Telehandler is taking a stab at one of the packets. Each packet contains 24 sleepers, and weighs 2 tons. They are the real deal. The supplier estimates they will last for 50 years. We certainly don't want to saddle our successors with the job of replacing them after only 10 years (as would be the case for treated softwood ones). On Wednesday a start was made on this job, but progress was slow due to having to set up the site, and the learning curve. They handled two of these packets, or 48 sleepers. Here the Telehandler has just dropped a packet of 24 on to the site, as Foremarke Hall pulls away from the inner home at Winchcombe, in a strong breeze. We tried out an alternative arangement for securing the chair screws. Left and right of a short piece of rail carrying the Stumec machine we laid two rows of sleepers to be treated. The Stumec would do up the inner set of screws, while portable nut runners (aka 'Animals') would do the outer ones, beyond its reach. Now for the practice: The Stumec immediately derailed. And it was so heavy too! It was all hands on deck to lift it back on to its re-railed cradle. Our very own Bert Ferrule then set up a chairscrew greasing station, from which we helped outrselves in great big oily handfuls. - 3600 chair screws, to be greased and hammered in. Don't hold back now, off you go! The hardwood sleepers are so heavy they can only be rolled to their positions. We made them up into little groups of 4. Heavy cast iron chairs were then dropped on to the pre-drilled holes and carefully lined up. In went the greasy chair screws, and they were then hammered down into their holes, to give the men with the 'Animals' something to bite on. Here come the men with the 'Animals', while the Stumec is coping with another derailment in the background. Sigh. Once 4 sleepers are all bolted up, the Telehandler comes along and lifts them away, to be stacked round the corner ready for loading. There's a constant hunt round the site for bearers, which are needed between each set of 4. With the sleeper transports to Broadway, they always end up at Childswickham, wheareas they are really needed at Winchcombe. More logistic challenges here. Today services were a mixture of steam and diesel, with a soupcon of extension DMU thrown in. The class 20 was around too, you could hear its characteristic trill from quite a distance away. Here the DMU pulls out of Winchcombe, with veteran driver John at the controls. He's one of us actually, but was pinched by ops to man this train. He gets a cheery wave from Nigel. Because we were at nearby Winchcombe today, Jim was persuaded to cook us lunch in the mess coach at Toddington. This is what he cooked up for us: Sausages, beans and big cut chips. No foreign food for this gang! Well done, Jim. The derailment of this heavy machine is interesting to watch. With too many people helping, we'd just get in each other's way. We're sticking to that story. After dealing with a considerable number of plain sleepers, we also fitted out 8 with lower profile 'Pan 11' base plates. These are destined for the two barrow crossings north and south of the platforms. Here you can see the Stumec actually at work. Yes, it's a rare picture. Treasure it. As we were manhandling another hardwood sleeper off the pile, Foremarke Hall steamed by again past the bracket signal. It's a distraction that we like, but the risk is that one of the sleeper rollers will look up to see it, while the other one rolls the sleeper off the pile and on to his foot. Careful where you put those boots then. Total so far: 200 sleepers, out of the 600 to do. The Saturday gang was declared the winner and will go through to the next round. We left the Stumec on site under a tarp, but the wheels on which it was rolled here had to go back in the GUV van. We watched Steve kick the wheels this way and that, trying to propel them in the right direction without bending down. One of our longest serving volunteers on the track gang is Ivor. He goes right back to the beginning of the railway in 1983. Ivor expertly drove our JCBs and crawler cranes in the early days, laying the track out of Toddington where there was none before. One day he mentioned where he got these skills from - driving tank transporters in the army. Always curious about people's other lives, we asked him what he did there, and Ivor promptly sent the photographs that follow, which we reproduce with permission, of course. Ivor was sent to post war Germany to do his National Service. It wasn't quite that simple, as originally the selection officer actually told him he was on a 'short list' to drive a staff car in Paris. 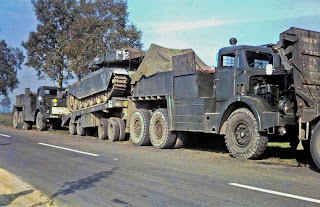 Not finding this very interesting, Ivor pleaded with the officer to let him drive tank transporters in Germany. And so it happened. 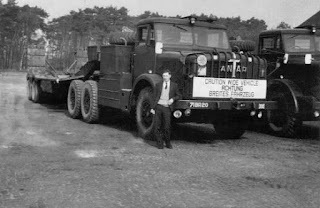 Here he is on the right, posing in front of one of the tank transporters, of the type with a trailer. In the background on the left you can see it sideways on. Here is a different one, of the ANTAR type that he also drove. This is the articulated type, with bilingual warning inscriptions on the front. The Centurion tank was one of the most successful British designs, with over 4000 produced between 1946 and 1962. It was replaced in the British army by the Chieftain. Ivor's HQ was on the Sennelager ranges (opened at the end of the 19th century to train German troops as Truppenübungsplatz Senne, located near the centre of Germany) and he also worked on the Lueneburg Heath ranges further north. Next to the Centurions, his ANTARs also hauled Conquerors, as well as many other items such as self propelled guns and half tracks. In this colour picture you can see him standing proudly in a boiler suit and wearing a Lance Corporal's stripe. Ivor was one of only two National Service soldiers in his unit to receive this honour, as National Service soldiers were not considered for promotion to NCOs. 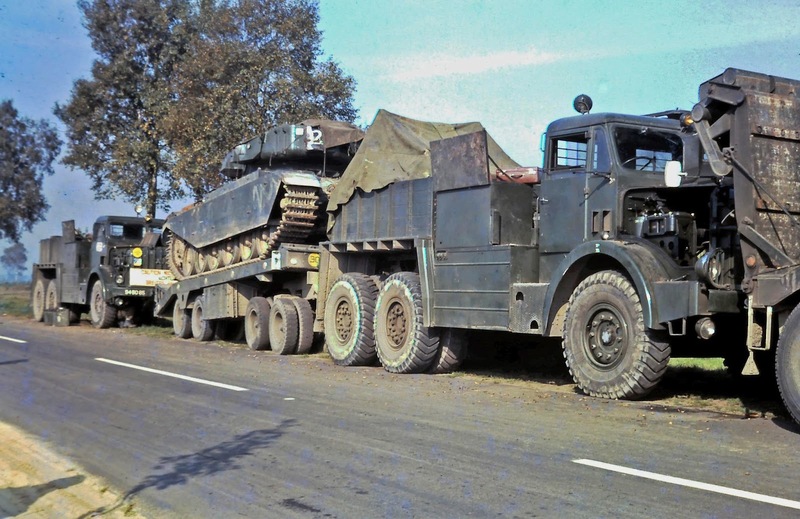 Ivor's unit used to move the tanks for training excercises to various ranges in Germany, and occasionally they even entered Belgium and Holland. The closest he ever came to real action was when his unit was sent to Berlin following the decision of the East Germans to divide the city (and indeed the entire country) by a large wall in August 1961. These were dangerous times. At Checkpoint Charlie Allied tanks faced Russian ones almost barrel to barrel, dug into the ruins of the city in the immediate vicinity of the new wall. On that occasion all the ammunition carried, including on the self propelled guns and on the British Army tanks was live, and ready for combat. Things were deadly serious. The Cuban missile crisis followed close behind in 1962, and Berlin was the flashpoint. This is the wreck of a Sherman which Ivor upended as a training ercercise for tank recovery. Finally, here's a very old shot of Ivor driving the railway's crawler crane at Toddington, while moving the newly arrived water tower from Ashford, Kent. The date is 31.05.1986. Ivor has now seen almost all of the track relaid from Toddington to Hunting Butts tunnel, and now on to Broadway. He's still with us, and practising one of his other skills, which is estimating the quantity of materials such as ballast, and in charge of ordering it. Hats off to Ivor, what a fascinating life you've had so far! So the wooden sleepers are now in the frame. Well done with chairing up, and very interesting is the article about Ivor. Regards, Paul. Learning curves.... how many alternative names for the Stumec do you have now? I,was surprised,that timber sleepers,could last for 50,years!.I,dare say,they're rather expensive!.You don't use through bolts,to secure the chairs,these days.As the GWR,did,then?.What were,those curved topped spikes called,that BR,used in the1950s/60s,to secure flat bottom rail,to timber sleepers?. Anthony. We no longer use GWR type throughbolts, and systematically replace them with AS1 chairs. It is very difficult indeed to replace sleepers with through bolt fixings on them. In the early days we were glad for any track we could obtain - such as army type sleepers, potts, second hand wood, worn rail. Since then our track is being gradually upgraded to FB rail on concrete sleepers, although many wood sleeper areas remain. As track fixing methods change, you really need to follow what the big boys are doing, otherwise you paint yourself into a corner and end up with track for which there are no components available on the market. Eg concrete sleepers with chairs are now very hard to find. We have been using modern pandrols for example, but even these are now being superceded by fastclips. Second hand concrete sleepers last for ages and are also very cheap. The price is about one fifth of new hardwood ones. Ivor's story is very engrossing & a big thank you to him for sharing it with us here. I looked up the Thornycroft Antar on Wikipedia. It had a shortened V8 land version of the V12 Merlin Aircraft engine, modified to run on diesel, and known as the Rolls-Royce Meteorite. Are there any still in use? I'll ask Ivor, he's on holiday for another week now. At RAF Folkingham, remains of the airfield are located on private property being used as agricultural fields, with the main north-south runway acting as hardstanding for hundreds of scrapped vehicles, including a Mkll Antar. There was also an R-R Meteor engine, used in tanks. Another name for the Stumec is "*$^&$$"! *(^%%" grunder". I know this as when on a visit to Wolverton Works the permanent way team were using one and had exactly the same problems!! so your not alone with the problems Jo! great report and so nice to see Ivor is still holding up his end! Those Antars fuel consumption was measures in gallons per mile!